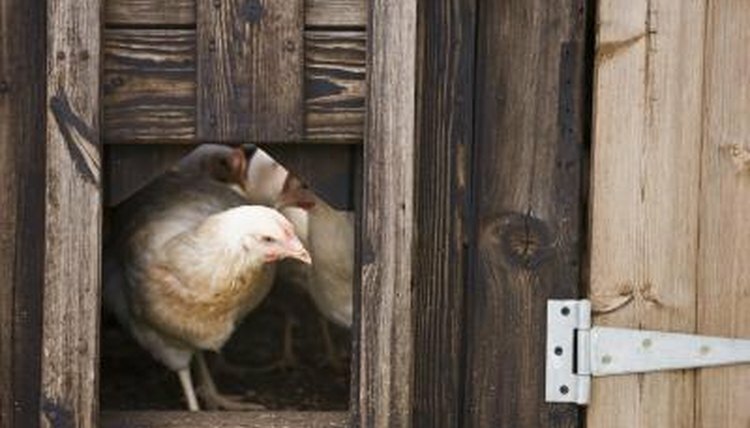 You may not be happy to learn that your chicken coop houses more than chickens and eggs. An assortment of bacteria, parasites and fungi may be sharing the same living quarters with your hens. Luckily, disinfecting the chicken coop can help keep diseases at bay and your flock healthy. Just make sure you add disinfecting your chicken coop routinely to your yearly to-do list and remember always to disinfect before bringing in a new flock. Your very first step in disinfecting your chicken coop is removing all poultry, shoveling up the litter, and removing any loose dirt, cobwebs and feathers from the coop. This also is a good time to remove other items, such as waterers, feeders and heat lamps. You want all surfaces to be exposed so you can clean them thoroughly. If there is a lot of dust, wet down the floor and let it air dry so it settles. Disinfecting directly without cleaning may sound like a quick and smart solution, but it turns out being an ineffective waste of time and money because you cannot decontaminate a dirty surface effectively. So, roll up your sleeves, and start sweeping and cleaning all surfaces using hot water and detergents. Only once all surfaces are clean and free of organic matter, you can then proceed to the next step, which is sanitation. Not all disinfectant products are created equal. You'll need to conduct some research to find which product will be fit for the job. Check the product's active ingredients and what bugs it kills. Also, see if it's safe for livestock, how it is applied and if it can damage certain surfaces. If your birds have been ill, consult with your vet for advice. Make sure you read all the labels and follow all of the safety precautions. If you're using strong products, you'll need to use protective gear, such as a pair of safety goggles or a face shield. Once you have chosen the most suitable product and did a preliminary cleaning, it's time to spray all surfaces and stationary objects with the disinfectant of your choice. Several products require dilution, so follow instructions carefully. Also, be careful to not breathe any of the mist. Then, scrape and brush as necessary to loosen up any traces of dirt and debris. Allow the product to seep for as long as suggested, and rinse it off if the label directs to do so. If you aren't too keen on using bleach or other harsh chemicals, there's good news for you. Plain, old white vinegar may be a good natural alternative that is much safer. Just mix equal parts of white vinegar and water in a bucket and pour it on the floor and all surfaces. Then, scrub all surfaces vigorously, making sure the vinegar solution distributes evenly. Finally, perform a final rinse using water and let the coop dry.